Finally, the perfect present any dog lover will be excited about! Can You Handle It? ... a unique gift for your dog lovers? ... something they'll actually be excited to use every day? ... a hassle-free gift that ships beautifully to their doorstep free of charge? The search ends right here, right now, with our funny "Dogs & Wine Make Life Better" 15 oz wine glass! An Affordable Wine Gift Solution! Whether you need a dog lover gift for men or women, Christmas present, stocking stuffer, Veterinarian, dog mom, dog dad, vet tech, animal rescue or for yourself, we've got you covered. No more hassle of hand washing another wine glass! Our wine glasses are Printed with superior ceramic inks that are fired on at a temperature of up to 1200 degrees. A truly permanent imprint that will never fade or lose its glow. DOG LOVER GIFT FOR MEN OR WOMEN! 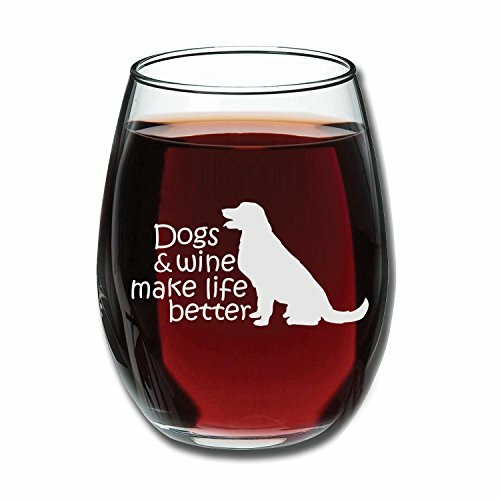 - If you are looking for a funny gift idea to surprise your wine and dog lover, then the Dogs & Wine Make Life Better 15 oz wine glass is the way to go. One of the top 10 white elephant gifts under 25 dollars. A perfect, humorous best friend gift idea for pet owner. CAREFULLY PACKAGED - Each dog lover wine glass is carefully packaged in a durable gift box; guaranteed to arrive safely with free shipping through Amazon Prime.